This grilled cheese sandwich combines sweet caramelized candy onions with savory gorgonzola cheese tucked under a gooey Havarti blanket. You may need a fork for this gourmet concoction! One of the ways I put up the Community Supported Agriculture (CSA) farm share produce is to use my freezer in creative ways. [And I don't mean the "fruit & veg freezer that doubles as a microwave stand" type creative freezer uses.] After I discovered Dorothy's Crock Pot Caramelized Onions I realized I could stock up on candy onions (a local sweet onion variety) at the end of the season, caramelize them all in one tear-filled marathon of slicing, and freeze individual packets to use throughout the year. Grilled cheese sandwiches rule [and Robert Barkers drool]. There--I've said it. 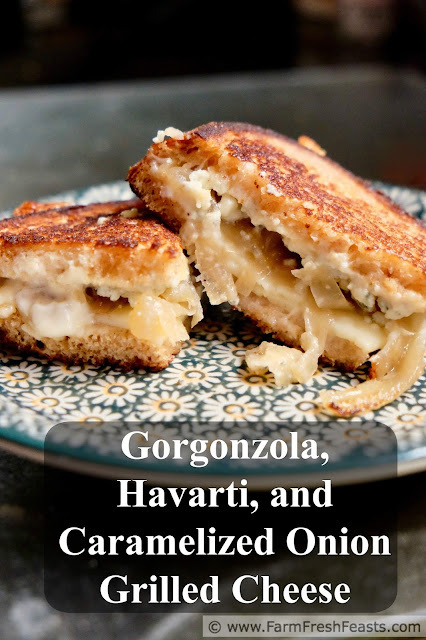 As someone trying to please a frequent vegetarian and 2 hungry teens simultaneously, I am finding that a platter of grilled cheese sandwich quarters* is my go to lunch nearly every weekend. Robert Barker is very intent on my sandwich. I didn't share. Saturday mornings we hit the farmer's market for eggs, meat, and bread. When we get home, I'll make up a pot of my Creamy Tomato Soup with Home-Canned Tomatoes, cobble together some sandwiches while it's simmering, and call it a complete meal. The kids choose whatever lunchmeat suits their fancy, the spouse can stay true to his desires not to eat industrially-produced meat, and I can get creative when the mood strikes or keep it simple when I just want to get food on the table. Everyone wins, and that's why I like grilled cheese. First Note: Caramelizing onions in the skillet takes time--easily 20-30 minutes. Caramelized onions store just fine in the fridge for several days or in the freezer for several months. 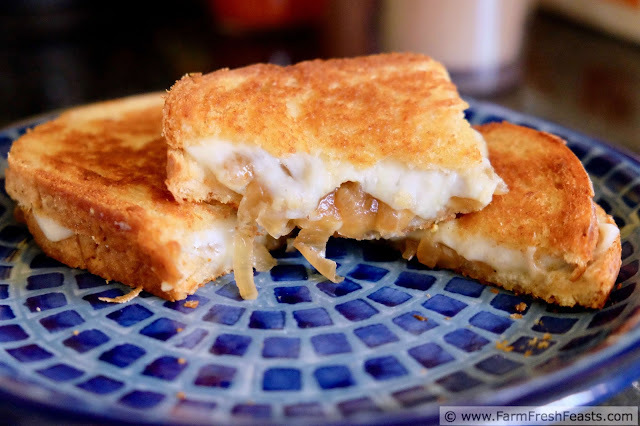 If you don't have a half cup of caramelized onions handy, choose a different grilled cheese sandwich and get on with lunch. Here are some ideas! Second Note: I used mayonnaise as the fat in this recipe for 2 reasons. Secondarily because I'd seen ads for some brand suggesting it. Primarily, though, because I ran out of mayo the other week, made my own, and was nervous enough about the raw eggs to prefer to use it in a cooked preparation. Please feel free to use butter or a buttery spread if you like. 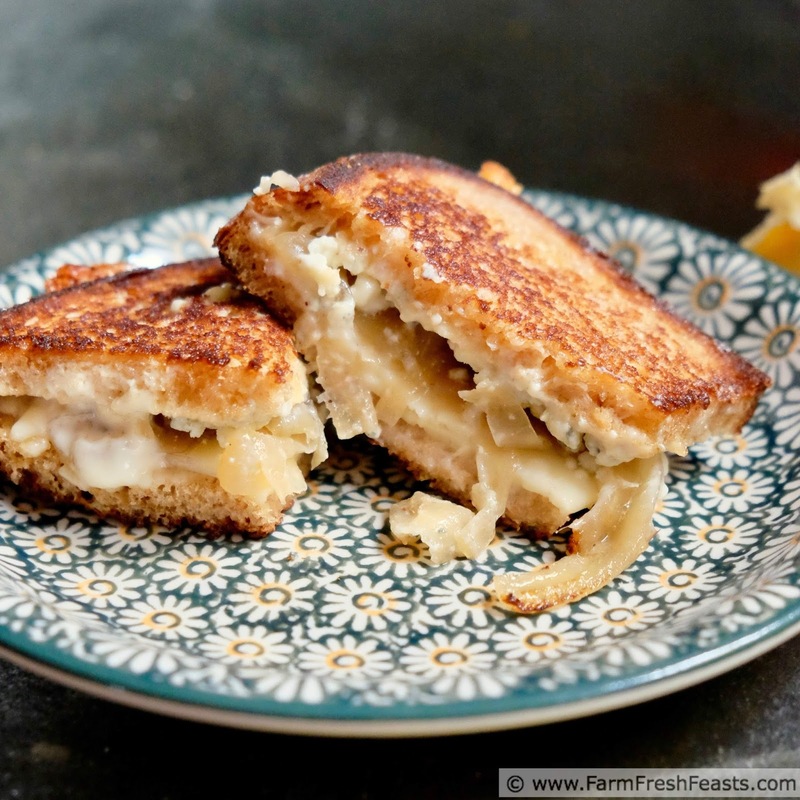 I know, it's a grilled cheese sandwich, how hard could it be? Preheat a 10-12 inch skillet over medium heat. I'm using cast iron. Lay the bread slices on a cutting board. Spread each slice with a thin layer of mayonnaise. Top 2 slices with about 2 Tablespoons each gorgonzola cheese. 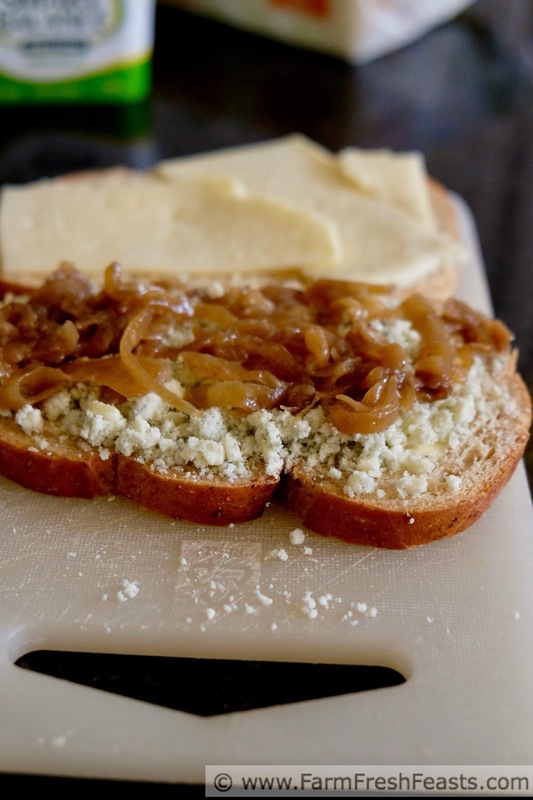 Divide caramelized onions evenly over gorgonzola. Place Havarti on top of remaining slices of bread, and flip over, cheese side down, on top of onions to make a sandwich. 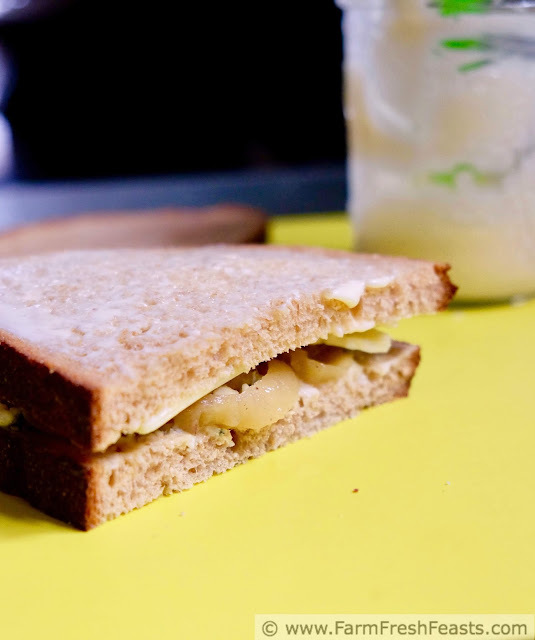 Spread top of sandwich with a thin layer of mayonnaise. Place sandwiches, mayonnaise side down, into preheated skillet. Spread new top of sandwich with a thin layer of mayonnaise. Carefully lift up a corner to check the bottom slice of bread, and when it's browned (2 to 4 minutes for me) flip the sandwich over. Once both sides of the sandwich are browned remove to cutting board and slice into quarters. *I grew up dunking quarters of grilled cheese sandwich in tomato soup, so I always cut mine into quarters. For more recipes using onions, please see my Onion Recipes page. It's part of the Visual Recipe Index by Ingredient, a resource for folks like me eating from the farm share, the farmer's market, the garden, the neighbor's garden, and great deals on ugly produce at the grocery store. 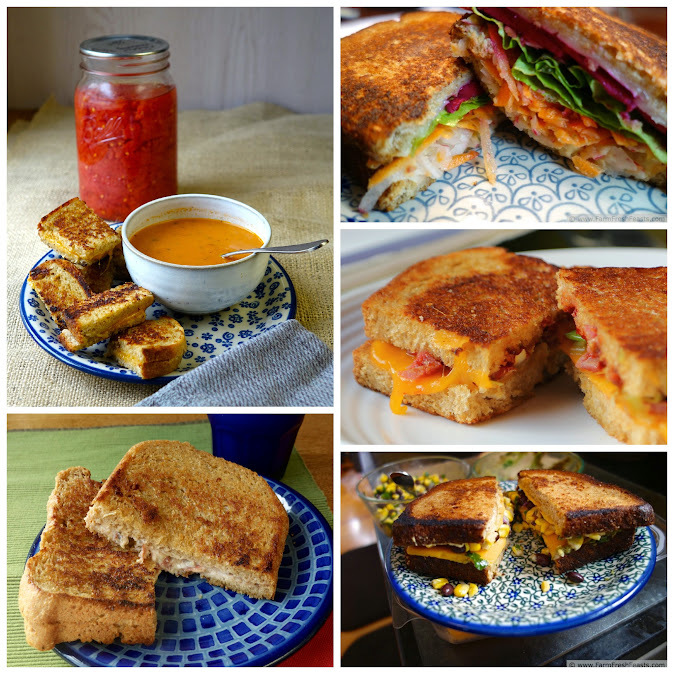 Grilled cheese and soup is pretty much a weekly staple around here too. What's not to love? This is rhetorical.